Mr. Gonzalez speaks to teleSUR about the latest developments in the Cuban Five case on the occasion of his visit to Nicaragua. 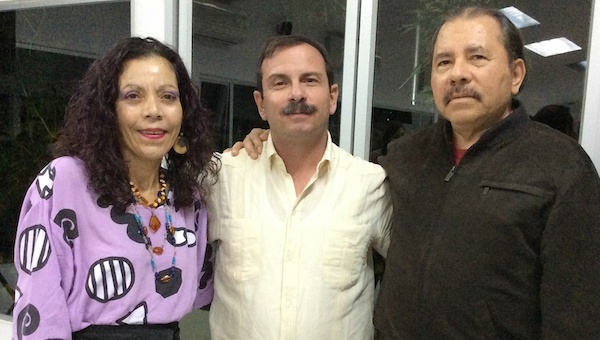 From right to Left: Nicaragua’s President Daniel Ortega, Fernando Gonzalez, and Daniel Ortega’s wife, Rosario. New WI BOPM Flier: Stop The War On Ferguson, Black Lives Matter! Fast Food workers across the United States are joining a nationwide strike with fast food workers December 4. Please join us as we fight for living wages, respect, and rights on the job! 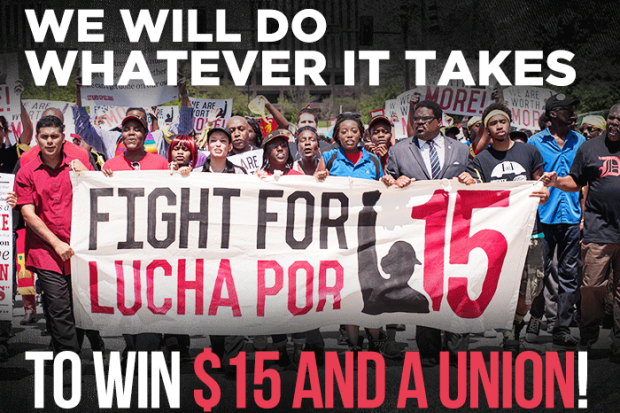 Let’s build the Fight for $15 Movement. We believe that we will win! If you believe #BlackandBrownLivesMatter then Come to Union SQ Monday December 1 starting at 12noon EST. 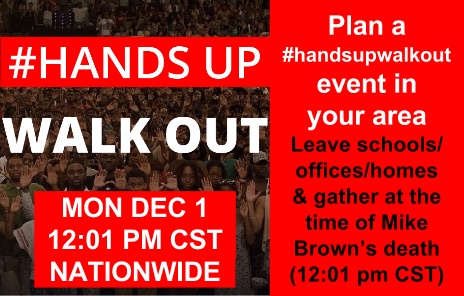 The movement in Ferguson, MO has called for people across the country to walk out of their jobs, schools, and homes starting at 12 pm CST in outrage over the murder of #MikeBrown and hundreds of people of color murdered by the police. Student,Worker, & Community groups are discussing plans for Walkout contingents to converge in Union SQ. on the Southside at 17th for an action. Ever since her unjust conviction on November 10th, Rasmea has been detained in St. Clair County Jail in Port Huron, Michigan. Three days later, her attorneys filed a motion calling on Judge Gershwin Drain to release her pending sentencing scheduled for March 10, 2015. Since our most recent update, the prosecution has filed a response to the motion, Rasmea’s lawyers have answered that filing, the National Lawyers Guild has filed its own friend of the court brief supporting Rasmea’s freedom, and hundreds of individuals and organizations from across the country have sent letters to the judge urging him to send Rasmea home. We expect that Judge Drain will be deciding if Rasmea will be freed very soon, but are still calling on supporters to keep up the fight to #FreeRasmeaNow! — Many of you have already submitted letters urging the judge to release Rasmea. We are still collecting individual and organizational letters to him. Use the sample letter and send your letters to justice4rasmea@uspcn.org right away. — Fundraise and contribute to Rasmea’s commissary fund and to her ongoing defense. Donate at www.stopfbi.net/donate. 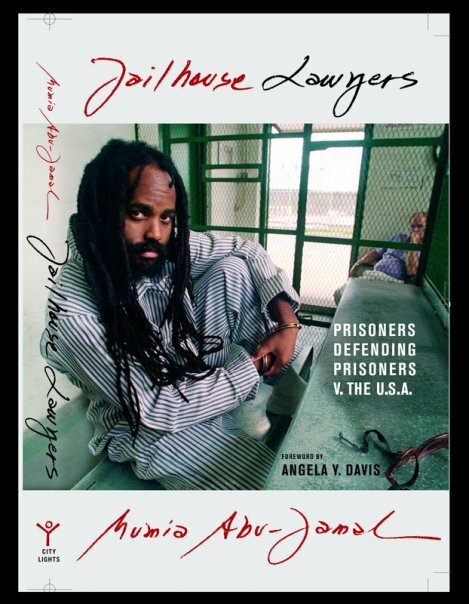 Commissary funds allow Rasmea to purchase food, blankets, writing materials, and other items to make her more comfortable in the jail. 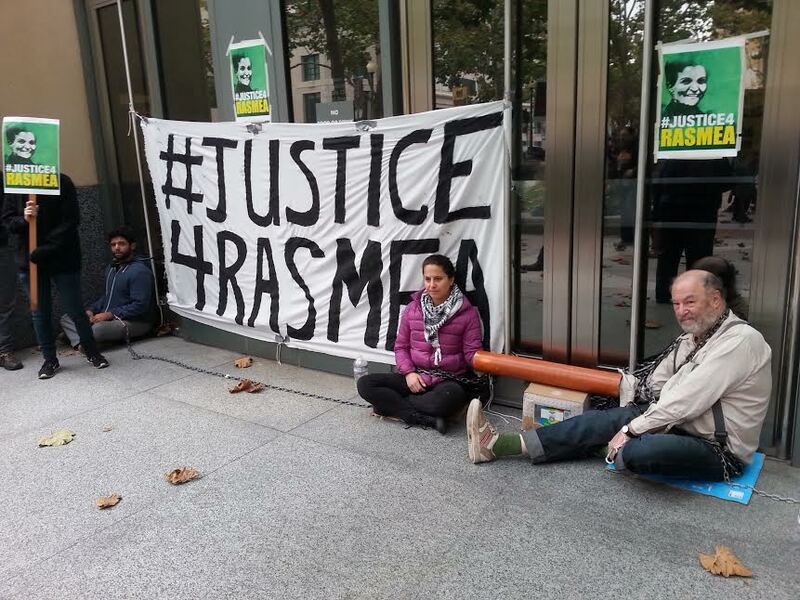 Expenses continue to mount for Rasmea’s legal defense and ongoing community organizing. We will file an appeal of this unjust verdict, and that will take resources. — Spread the word! When publicizing on social media, use the hashtags #Justice4Rasmea and #FreeRasmeaNow.